This morning, Chrysler announced that their new Ram 3500 Heavy Duty is so good at towing, it makes all other trucks look like weak little girlie trucks suitable only for feeble people who live in nursing homes. Why? Because it can tow 30,000 goddamn pounds, that's why. Chrysler claims that the top Ram can pull such astronomical weight thanks a new high-strength steel frame, a higher-load transmission and improved transfer case, an improved 6.7-liter Cummins Turbo Diesel engine with 850 pound-feet of torque, and other trucky goodies. They say that the nearest competitor can only tow a maximum of 23,100 pounds. It doesn't take a math genius to realize that 30,000 pounds is a lot of pounds. I went in search of something that the Ram HD is capable of towing, and here's the best example I could find: the Massive Ordnance Penetrator. No, that's not the name of my new thrash metal band — it's America's newest "super bomb" designed to blow people up even if they tunnel deep underground. At 20 feet long and 30,000 pounds in size, it's capable of penetrating up to 200 feet underground before it explodes. That sounds nuts, but it's part of the U.S. military's effort to rely less on nuclear weapons, which risk fallout and contamination if they're used. Typically, it's carried into war zones by a B-52, but now the Ram can simply tow it into battle. 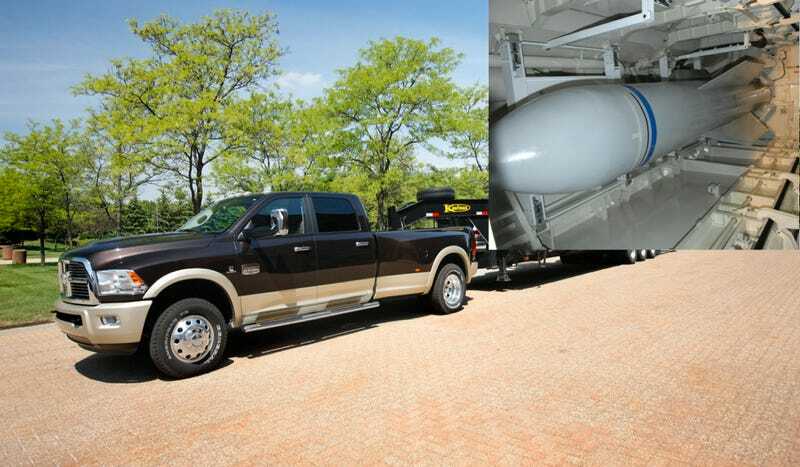 Our most powerful truck towing our most powerful bomb — what could be more American than that? So if anyone out there has a Massive Ordinance Penetrator they need hauled around, give the folks at Ram a call.